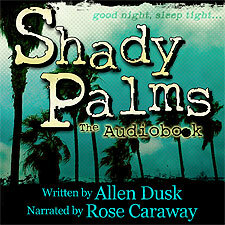 I am pleased to announce my gritty splatterpunk novel Shady Palms is now available as an audiobook! Rose Caraway provided one hell of an amazing narration of this macabre tale. Grab your digital download at Audible, iTunes, and Amazon, or head over to The Kiss Me Quicks to sample Shady Palms through Rose’s podcast. For those lovers of the written word Shady Palms is available as a trade paperback and ebook from Amazon, Barnes & Noble, iBooks, & Smashwords.